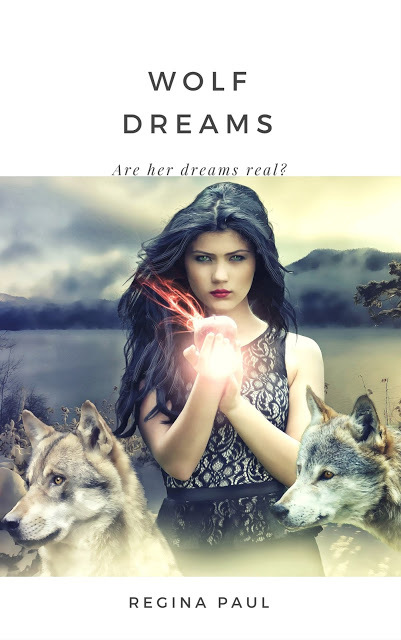 Speculative Romance Author Regina Paul: Free Serial Romance: Wolf Dreams by Regina Paul, Part 2 404 ~ Page Not Found! I'm dreaming again, I can always tell by the way I'm hyperaware of my surroundings. The forest around me is dark and quiet. Unlike a real forest, there are no sounds of animals rustling in the grasses or leaves, no hoot owls or scurrying of squirrels or chipmunks. The dark light is shading everything in blue and black. There are shadows everywhere I look, and I've never been so needy to hear even a hoot owl, or any form of life for that matter. But this forest is unlike any forest I've ever seen before, it's supernatural, maybe even preternatural, and alive in a way I can feel but can't quite explain. Just yesterday I was waking up from my usual dream about the girl and her wolf friends, going to my classes, and my work study job and just trying to forget about it all by living my very mundane life. I should have known better, because the dreams never leave me for long. This dream is different though. I've never been in this forest before, and I have no idea what is in store for me here. Suddenly out of the corner of my eye a shadow slips from behind a tree that is just a few feet from me. A very large tree and a very large shadow. The shadow is over six feet tall and has the shape of a man. "You cannot have her, human." On some level I know he is talking about the girl, the one who I've been dreaming about for as long as I can remember and whose name I don't even know. "I don't know what you're talking about." I say flatly. The shadow moves closer and I take another step back in self preservation. "Oh, but I think you do, my pretty." As I watch, the shadow hunches over, nearly in half, and the voice which has been smooth and beautiful albiet sinister turns to a harsh gravel sound. I take another step back because I have no idea at this point what I'm dealing with. Usually at this juncture in a nightmare I wake up before I can see whatever it is. Not so this night. Instead the shadow lifts a hand, and speaks a word in a language I've never heard before. A round ball of light appears above what I can now see is a brown palm. The palm lifts towards the creature's face. I want to run, wake up, something but it's as though my feet have grown roots deep into the forest floor and I cannot move. Run, it's not safe for you here! A soft female voice says in my mind. The creature before me snarls as though he too hears the whispering voice. "I knew if I brought you here, she'd come." I stare as the ball of light reaches the creature's face and something from a horror film is revealed. The skin of it's face is twisted up in a caricature of a smiling snarl, long black matted hair frames the nightmare vision. I am beginning to get an idea of who he is talking about. Does he mean the girl and her wolves? And what does he mean by saying he brought me here? Do not engage him, do not speak, it is a trap, you must wake up now Leilani! The same soft, strong voice whispers in my mind. No, I've freed you, wake up now, Leilani, before he traps us both! My eyes fly open and I sit up with a gasp. When I turn my head to look at the clock it says 3:00 am. (c) Copyright 2017 by Regina Paul. All Rights Reserved.